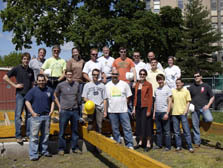 A sampling of Team Boston members gathers at the initial construction site of Curio.House, the team's Solar Decathlon 2009 entry. Curio.House, the house designed by Team Boston, gives new meaning to the phrase "information is power." A monitoring system allows homeowners to track energy use in real time, which enables them to make adjustments to reduce energy bills and environmental impact. Curio.House, the home designed by Team Boston, is designed to trigger curiosity about how well-designed homes can help save energy, money, and the health of the planet. The team has satisfied that curiosity by incorporating an energy monitoring system into its home. This system provides real-time feedback so homeowners can take control. By knowing exactly how much energy they are using and when they are using it, they can choose to adjust their habits to reduce their energy bills and environmental impact. Team Boston is composed of more than 150 students from Boston Architectural College (BAC) and Tufts University as well as a handful from the Massachusetts Institute of Technology, Harvard University Graduate School of Design, Northeastern University, and Massachusetts College of Art and Design. BAC and Tufts complement each other: BAC students offer design and construction management expertise, and Tufts students provide engineering skills with proficiency in social, environmental, and economic disciplines. The team also takes advice from Boston-area professionals. Kevin Horne, a BAC project director says, "The most valuable asset to our team is our strength and our breadth." Ben Steinberg, a Tufts project director, agrees. "We tried to involve as many people as possible in the design process," he says. "Being inclusive contributes to the overall pool of knowledge. It's one of my favorite things about the Solar Decathlon process." The house employs features such as photovoltaic panels on the roof, a solar thermal hot water system, passive solar design, daylighting, and energy-efficient lighting. But the feature that truly empowers the homeowner is a monitoring system. It gives new meaning to the phrase "information is power." By showing exactly how much energy is being used and when, the system allows the homeowner to choose how to adjust his or her habits to reduce energy consumption.